I too evacuated with Mrs Ivy Trellis, writes 'Granners', the reason being that the Luftwaffe returning from a bombing raid on Liverpool, jettisoned a surplus bomb over Llandinam killing Daisy the cow (later mounted and stuffed), and sending the local good-time-girl and her eponymous, sorry anonymous companion flying home with legs and knickers akimbo! There's no doubt that she put a major part of herself into Scunthorpe as did my old mate Nobby into Penistone. It was an interesting episode in my life though I remember it being hard most of the time...with rationing and all that austerity. I hope I have got this story off pat. Best wishes, Granners. Have you ever mounted a mole ? Please email us with your "subterranean" experiences and seek professional help from our experts. 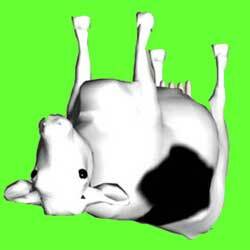 Have you come across an exploding cow ? Please bomb us with your experiences.